Pinot Grigio or Pinot Gris? 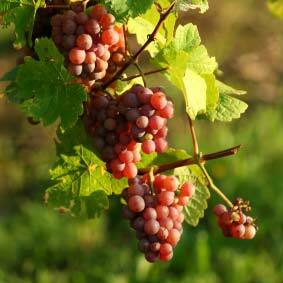 Okay, so Pinot Grigio are what the Italians call it, and to the French, Pinot Gris – both mean “Grey Pinot”. The grape can vary in colour, darker or lighter (Darker Pinot Grigio grape shown in picture to left). These are different resulting wines, from the same grape. Generally, P. Grigio is more fragrant, fruit driven, lighter-dry style, and P.Gris is slightly more heavy, oily-dry, also can be fruity but sometimes more acidic (lemon, lime) than P. Grigio. Both wine styles can be grown well in Australia. Pinot Gris/Grigio have so far grown really well in areas such as Mornington Peninsula (Vic), Geelong (Vic), and Adelaide Hills (SA), as well as Tasmania – these all produce white wines well due to the cooler climate terroir. These wines are increasing in popularity, catching up to the Sauvignon Blancs (Oyster Bay NZ ring a bell?) and SSB (Semillon Sauvignon Blanc) wines that are most popular of white wines in Australia. Personally, I prefer trying more Pinot Gris/Grigios to Sauv Blanc, as the varying delicate, aromatic, dry and refreshing palate, to full bodied, oily, almost overwhelming complexities are very interesting, and each Pinot G can be made to turn out so differently. I think it’s rather exciting! From Miceli – their Iolanda Pinot Grigio @ $20 a bottle. I loved the fresh, slightly crisp fruit, like a nashi pear, and luscious grapes on the palate up front, with the aroma and freshness of hay and green grass, and a long, lingering palate with underlying creaminess. For $20 a bot I found this was great value! Pinot gris !No hesitation ! You have a very interesting blog. It's great to have others opinions of wine and restaurants. Thanks for popping over to my blog!